on the woodside. : *bon 'chovy. There's no question in my mind that if I had limitless funds, energy, and time, I would blog every single day. As it happens, I work in editorial, am limping along on the last fumes of Halloween candy, and ... well, I have time. But who else is going to watch all the episodes of Diners, Drive-Ins, and Dives while balancing a bowl of Cheez-Its and a 12-pack of Fresca? WHO, I ask you? The fact is I'm a terribly easily distracted little bird, and I do have a shameful tendency to wander off from this space from time to time. I tend to notice its neglect right about the time that I realize how much I miss it. And in the interest of full disclosure, I did run completely out of money there for a minute. I broke my phone, and then I had to buy a new phone, and then I overdrew my checking account, and then I couldn't get caught up, and then I just sort of assumed nobody wanted to trot over here for daily updates on my salty tears and crummy meals. BUT! I have made some soul-warming dishes lately, back before I roared off the fiscal cliff, and ... well, therein lies the problem. Because I am such a tremendously organized and meticulous person, naturally I don't write these things down. I just store them in my brain until the Cabernet eats them. 1. Cooks Illustrated is right: If you want to give a savory dish a little oomph, what Rachael Ray calls "the thing that makes them go hmmmmmmmm," PUT ANCHOVIES IN IT. Yes, you heard me. I just need to find packaged anchovies that aren't in those little un-resealable tins, and then I am putting those little fishes in ev-er-y-thing. Get excited. This is what makes jarred marinara taste not like jarred marinara. Just trust me. You can't taste them. They're just magic. 2. When broiling mozzarella atop chicken, skip the fresh stuff. I used it here and it just never wanted to bubble up and brown the way I wanted it to. Grate that little part-skim block for the best result. 3. 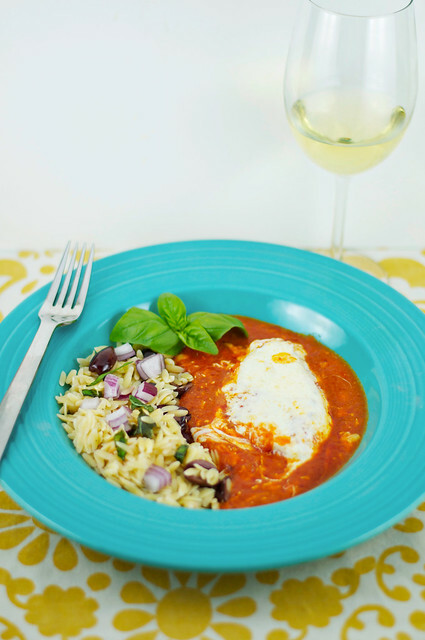 Orzo is delicious with anything. I defy you to think of one single thing that wouldn't be good stirred into that stuff. Red onion and basil and red wine vinegar are at the top of my list, but beans, peas, cheese, rotisserie chicken—impossible to go wrong. 1. Preheat broiler. Cook orzo in boiling salted water according to package directions, drain, and set aside. 2. Heat 1 tablespoon oil in a large, deep skillet over medium heat; add garlic, red pepper, and anchovies, stirring to break up filets. Cook 1 minute or until fragrant but not browned; stir in marinara, and bring to a simmer. Nestle chicken breasts into marinara sauce; reduce heat to medium-low, cover, and cook, turning once, 10 minutes or until chicken is cooked through. 3. Top chicken breasts with cheese, and broil until mozzarella is bubbly and browned. 4. Meanwhile, combine onion and next 4 ingredients in a large bowl; toss with reserved orzo and remaining 1 tablespoon olive oil. Season with black pepper to taste. 5. 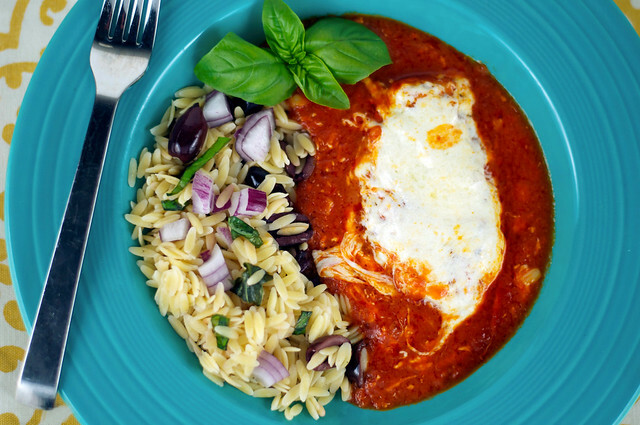 Serve orzo alongside chicken and marinara sauce. Garnish, if desired. Makes 4 servings. i love the chovy, which is what they're called in my house. those furry little fishes always have a welcomed place on my fridge door. Totally agree with #1. Anchovies are a gift to my taste buds. Good to know about #2. And yes to #3 as well, my favorite easy orzo having it as a cold salad with orzo, cucumbers and tomatoes, dressed in a simple balsamic vinegrette.